The Occasionist: Weeknight Dinner Party: The Recipes Have Arrived! Having friends round for dinner is one of my favorite "Occasionist" activites. I love to make a meal, and relax in the living room with a few friends. I find it is a good opportunity to really focus on my friends. Plus, it feels good to take off my shoes and curl up with some of my favorite people for a good chat. 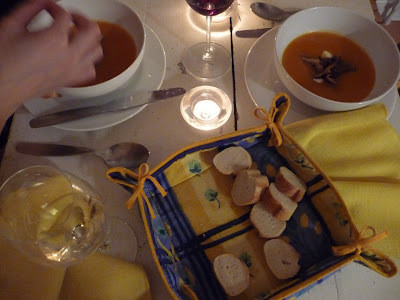 But everyone gets busy on weekends with social things, so I often find myself making an occasion of a weeknight, and inviting people for a casual meal and a glass of wine before heading off to bed at a still reasonable hour. I've heard rumblings of interest in seeing some recipes on The Occasionist, so that is what follows. I've put together another weeknight dinner menu with step by step instructions. Do let me know if you try the recipes! Preheat oven to 375. Put feta slices in a baking dish. Drizzle in olive oil and honey. Bake for approx. 15 minutes or until feta is fully heated and the liquids around it are bubbling. Finish with black pepper and thyme. Serve warm with bread. Toss the lettuce and mint leaves together with olive oil and fresh lemon juice. Plate the greens. 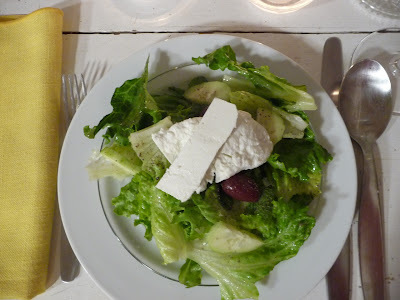 Arrange sliced cucumbers and olives, and a piece of feta cheese on top of each plate of greens. Sprinkle with salt and pepper. Preheat oven to 350. Cut the squash in half and scoop out seeds. Place squash halves, cut side down, on a baking sheet. Bake until the squash is completely soft. (The baking time will depend upon how big the squash is so probably between 30 minutes and an hour.) Remove from oven and let cool. Scoop the flesh out of the skin and into a cuisinart. Blend well, adding water as needed to allow the squash to puree thoroughly. Pour the squash into a pot and put it over medium to low heat on the stove. Add chicken stock or water until you reach your desired thickness. (The soup can be made with just water, though chicken stock will add a bit more depth of flavor. Do not use all chicken stock though as the flavor will be too meaty. I usually do 3 to 1, water to chicken stock.) Add butter and stir periodically. Let the soup simmer for about 15 minutes. Add salt, pepper and cayenne pepper to taste. The soup can be made ahead and refrigerated for a few days. Just heat it up again, and add more water to get the desired thickness. I like this soup with a little garnish of plain yogurt or creme fraiche. This will cut the spice from the cayenne pepper and cool your mouth. In addition you can sprinkle on a few chopped chives, or sauteed mushrooms. For the mushrooms: Slice mushrooms. Add to sauce pan over medium heat. Stir frequently. Add butter and stir until mushrooms are tender, but not too mushy and droopy. About 5 minutes. This is a scrumptious recipe from "The Cheese Board: Collective Works" The Cheese Board is an utterly delicious bread and cheese shop in Berkeley, CA. They make shortbread cookies every day. 2/3 cup (11 Tbls) unsalted butter, room temp. Preheat oven to 350. Butter a 9-13" glass baking dish. Cream together the butter, sugar and salt until light and fluffy. Add flour and kneed together until combined. Add hazelnuts. Press the dough evenly into the baking dish. Bake for about 20 minutes, or until the edges turn a golden brown. Let cool, then cut carefully with a sharp knife into small squares. You make it seem so easy...maybe casual is a better word as in "it can be easy to make an occasion casual"!